A few days ago, a friend of mine, who is a teacher asked me to take part in a meaningful project: to talk to her students about what I learned during a recent visit to Palestine. She wanted to teach them that what they read or watch on television are not abstracts, and that behind the words and images are real people, with feelings of sorrow, joy, and love. When I entered the “Eduardo De Filippo” institute, in Villanova di Guidonia, near Rome, I felt tense; I am not a trained teacher. Would I be able to interest them in the lives of a nation on the other side of the Mediterranean Sea? I decided to make the images, the stories and the faces talk. I wanted them to know about the daily nightmare of Palestinians at Israeli checkpoints. They saw people in Hebron, who are forced to put net atop their streets and shops to block objects, stones and garbage thrown by the illegal Jewish settlers who live there, protected by a large contingent of Israeli soldiers. They saw how people live in a Palestinian refugee camp in Bethlehem and another in Jordan. They saw the Israeli system of segregated roads and the wall of shame. They saw Gaza left in the dark, with flashes of light that come with Israeli bombs; they saw desperate Gazan travelers waiting to cross at the Rafah-Egypt border, seeking escape. They saw the black-and-white photos of the Palestinians who were exiled during the Nakba, who are still denied their right to return. They briefly witnessed how horrible life is under military occupation. 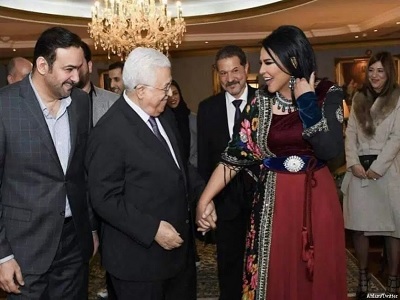 But I also told them that Palestinians are not only victims: they are able to resist, to mobilize themselves, they fall in love, they have children and they pray. I showed them dakba dances, pictures of the delicious maklouba, hummus, knafeh. 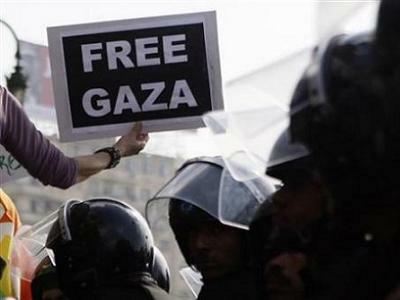 They needed to know that Palestinians are able to live; in fact teach life; and that life keeps flowing like a river, thanks to the resilience that this undefeated nation constantly prove, in spite of the horrors of occupation and war. The children’s response was surprising: they were moved and very attentive. In the following days, they kept talking about it to their teacher. The children wondered why nobody would do anything to help Palestinians. They sought solutions. They spoke of a solution that looked very similar to the “one state solution”. Co-existence with rights and dignity for all came natural to them. Oddly, our Western leaders still borrow from a defunct political discourse, that seek dead-end formulas like the so-called “two peoples two States” – useful to seek moral self-absolution, perhaps, but will certainly not solve the problem. A few days after I spoke at the school, I read an article about Italy’s April 25 march; the Liberation Day commemorating the end of the Second World War and the end of Nazi Occupation thanks to Italian partisans. As a result, the Democratic Party, (the main center-left party in Italy) has decided not to attend the Liberation Day march in Rome. 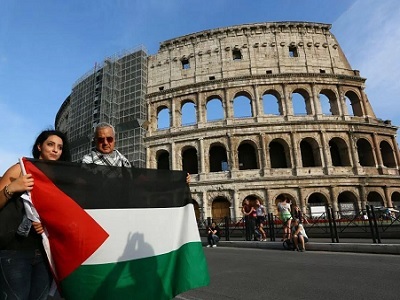 The statement sounded quite obscure, without context, until I learned through the Israeli newspaper Haaretz that Rome’s Jewish community decided to boycott the march, citing the participation of Palestinian groups. They called the Palestinians “heirs of the Mufti of Jerusalem”, and bragged about the Jewish Brigade, a group of 5,000 Jewish volunteers in the British Army who served in Europe and in Italy during World War II. Their underhanded intention was clear: exploiting the direct involvement of Jews in the struggle for Liberation from Nazi-Fascism. By deliberately decontextualizing the meeting between Amin al-Husseini and Hitler they serve a dual purpose: they corrupt the historical heritage of Palestinians and they totally deny the fact that Israel is now an occupying power and that Palestinian people are the victims and resisters of that military occupation and the colonial policies. The Israeli flags that proudly wave during the march is in fact the symbol of Israeli occupation and Palestinian oppression. I am not surprised at all: this historical revisionism is a main feature of Israeli propaganda (hasbara). Sadly, Orfini’’s opportunistic statement doesn’t surprise me either. The Liberation Day is an important holiday for the men and the women who truly fought “on the mountains of Italy” against the German occupiers. But it is also an important holiday for their children and grandchildren, who could learn a lesson of dignity: the dignity of a people able to resist, a people who refused to crumble in the midst of occupation; a people who built a national identity based on the values of freedom and justice. The PD representatives have already betrayed those values: they do it on an historical level, every time they do not challenge the revisionism that compares the partisans to the Italian Social Republic; they do it every time they turn a blind eye to the horrors of Israeli occupation, the Wall of shame, neocolonialism; and every time they deny the Palestinians the right to resist. Celebrating history makes no sense, if we are not able to apply those lessons to the present day. As for the left, it has no hope, if it uses Che Guevara as a capitalistic symbol to be exploited on t-shirts, but is not able to “feel deeply any injustice committed against any person in any part of the world”, like the children in Villanova did. An important thing to remember is that anti-Zionism is a completely different thing from anti-semitism – and (since the Naqba) fully justifiable – as you so beautifully describe.